1 Turntable for power-sliding in front of the building. 2 Kick Plate: the hydraulic Kick Plate causes the vehicle to oversteer to the right or left on a wet, low-friction surface with varying intensity. The driver can experience the effect of electronic stability control, and also practice countersteering and improve his reaction time when the systems are switched off. 3 Driver development track: the course resembles a country road with numerous curves. 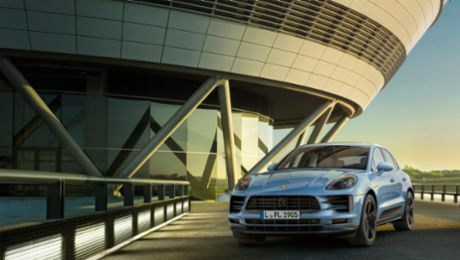 With a professional instructor at his side, the driver can improve his driving skills and practice smooth and precise steering, braking, and acceleration, also allowing him to experience the capabilities of a Porsche in great detail. A hot lap with a professional instructor is also available. 4 Dynamics Area: the Dynamics Area provides space for slalom, full-force braking, and lane-change exercises. 5 Low-Friction Circle: a flat circular track with a polished concrete surface and uniform inward slope designed so drivers can experience over- and understeer as well as drifting. 6 Low-Friction Handling Course: a tight course with a polished concrete surface and on- and off-camber corners designed for drifting. 7 Off-road Course: 21 off-road disciplines including a creek bed and a 45° vertical descent. In Carson, CA near Los Angeles, with the PEC West a second Porsche Experience Center is being built in the U.S. Located close to Los Angeles International Airport between the 405 and 110 freeways, the center will include a driver development track and a challenging off-road course. It will provide a home for the headquarters of Porsche Motorsport North America and classic car restoration. With the Porsche Experience Center in Shanghai, Porsche will open the first facility in Asia. It is immediately adjacent to Shanghai International Circuit, a Formula 1 track. The nearly 100,000-square meter grounds will include all driving tests, from the handling circuit to a dynamics area and a low-friction circle. The Experience Center located at the 2.9-kilometer Maison Blanche race track opened in June 2015 and offers a handling circuit, various driving modules, and an off-road course. At the heart of the legendary Le Mans 24-hour race track, customers can also pick up new vehicles, have their Porsche serviced, and visit the exclusive vehicle exhibition. The five-kilometer track is close to the race track at Silverstone and is characterized by its exceptional flexibility. It can be utilized in its entirety or in its individual sections: the handling course, straights, kick plate, ice hill, low-friction course, and off-road course. The customer center offers exhibition spaces, conference rooms, and a human performance center. Eleven spectacular corners from world-renowned race tracks, such as the Suzuka S (Suzuka/JP) and the Parabolica (Monza/IT), are part of the 3.7-kilometer circuit. The new dynamics course (2.2 kilometers in length) in the infield includes a wet handling course and a low-friction circle that measures 120 meters in diameter. The off-road course offers 15 different components. From Stuttgart to Le Mans. In two weeks. With vehicles worth 1000 euros each.